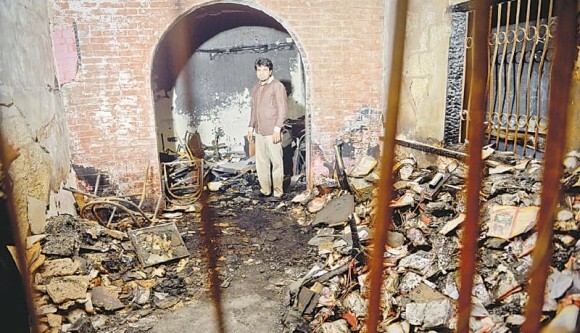 KARACHI: The owner of a web TV channel, whose office was damaged in a fire that broke out under ‘mysterious’ circumstances on Monday, believed it was an ‘arson attack’ and said on Thursday that he had been receiving threats for “the past six months”. Situated in a congested lane of a predominantly Christian neighbourhood in Akhter Colony’s C-Sector, the web TV office is set up on the first floor of a four-storey building with a Catholic church, St Peter’s Church, standing right across it. Sarfaraz William, the web TV owner, was the first one to be informed by the Mehmoodabad police personnel when the fire broke out in its office between 2:30am and 3am on Monday. Standing near a pile of burnt copies of the holy books in the three-room apartment, Mr William spoke about the threats he had been receiving since May. The threat was followed by a complaint by the same organisation at the Mehmoodabad police station against “increasing tableegh by members of different religious groups”. The police officers, according to Mr William, did not take any action but it “forced us to be cautious”. Working from the same neighbourhood for the past seven years, the office of Gawahi.tv is funded by the Gawahi Welfare Organisation, also owned by Mr William. Giving a tour of the three-room office, which was dark and filled with the smell of burnt plastic, Mr William pointed towards the missing database of the destroyed computers in the editing room. The fire brigade, which came to the rescue on a call of the Mehmoodabad police station at around 4am on Monday, in its initial inquiry reportedly stated that the fire was caused by ‘a short-circuit’. According to a recent department policy, he explained, “the fire department is not allowed to state the cause of a fire until they are 100 per cent sure of it. On their part, Mr William and his team made sure to lodge an FIR on Thursday and were waiting for the police officers to complete the investigation. “The police have been very accommodative and cooperative for the past four days. For now, we are waiting to see what becomes of the investigation,” said Mr William.